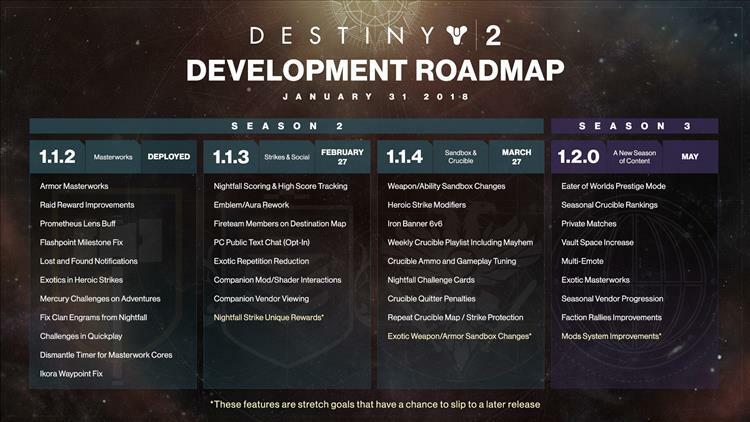 The Bungie development update from January 11th on their struggling flagship title Destiny 2 has become a full blown roadmap covering next 4 months. But is it enough? Is it really anything at all? The day before the update, I detailed the game's state, struggles, and provided my own opinion of what would constitute the necessary shift to actually save this flailing title and disgruntled community around it. The three things I wanted to see in that update was 1.) a mea culpa, 2.) a dramatic shift in the core endgame, and 3.) that this shift should not be part of any paid DLC. What Bungie laid out was far from what I feel was necessary. First of all there wasn't anything close to a mea culpa or any form of apology. Bungie continues to be a team of people either composed of or at least led publicly by those who are not capable of admitting their mistakes. They made massive, wholesale changes to a successful product that fans adored in Destiny 1 and continue to think slightly tweaking this aberration will somehow recreate the magic of the original. I have no faith in a public voice that needs to drastically shift course that cannot even admit it's off track. What we get instead are tepid whimpers of "scales" being tipped wrongly, and a host of "new" content which almost entirely consists of that which makes no difference to the brokenness of the game or that which was simply removed from the original. If they can't see where and how they made mistakes, if they can't admit those mistakes, what hope is there that the changes will address the issues or that these same errors will be made again in the future? Secondly this proposed changes do nothing to address the core problem in Destiny 2: in Destiny 1 you lived a power fantasy as an all-conquering space wizard flipping between powerful weapons and even more awesome abilities. Destiny 2 sees you slogging through a power vacuum as your ability cool downs have been slowed to the point of near useless ness and weapons have not only been toned down to a lukewarm glass of disappointment while at the same time complete reworking the load out to further restrict your ability to even equip the more interesting archetypes. In Destiny 1 you were Superman. In Destiny 2 you're Clark Kent. But the roadmap addresses this nowhere. What we get instead is armor tweaks (news flash, armor perks are useless in Destiny 2) the reintroduction of those missing Destiny 1 features (like Strike scoring, 6v6 PvP, missing PvP modes), a leaderboard for a PvP no one is really playing anymore (the week before last Trails dropped to below 100k participants for the first time in Destiny franchise history, a week where I realized not one member of my clan dozens strong had even played a match between us), and promises for better loot in the farthest future of the announcement, but those are items too far out to actually appear on the roadmap. Essentially nothing that actually moves you closer to Superman, now you're just Clark Kent with nicer spectacles and Metropolis got a coat of paint. Oh and there's also vault space improvement fantasies but honestly, they've been singing that tune so long it rings hollow. Vault space was held back late in Destiny 1's lifecycle under the promise that the new architecture of Destiny 2 would clear all that up only to immediately run into the problem again at the outset of the new version. Thankfully, the vast majority of these changes will be rolled out to the playing community for free. But the only real changes I see anywhere in the update or roadmap that might actually heal what ails the game being penned for Fall 2018 under the single bullet point of Weapon Slot and Archetype Improvements, there's a good chance that will eventually fall under a new DLC, and it almost certainly will be too little too late.